Soundmass are happy to announce their VINYL re-issue of the LIGHTFORCE album Battlezone. This release was their independent 1987 cassette-only debut, never officially released in full on CD, let alone vinyl. You would be lucky to ever find a copy of the original cassette and the original version of “Fast Lane” was left off their 1986 To 1989 compilation. 32 years on, Battlezone is being made readily available again on 10” vinyl and CD, remastered for a superior heavy/power metal experience. Everybody knows Lightforce as the predecessor to Mortification, the Australian death/thrash band fronted by Lightforce bassist Steve Rowe. 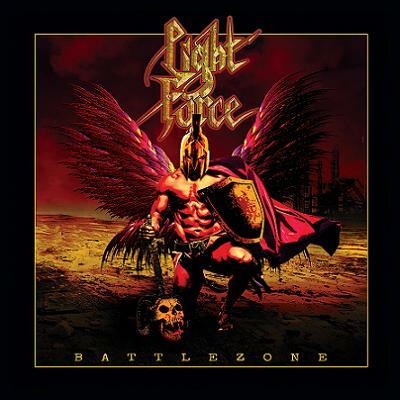 However, Lightforce was a totally different beast, with their music completely rooted in traditional heavy metal. They were heavily influenced by the classic early 80’s metal of bands like Judas Priest, Manowar and especially Iron Maiden – the abundant melody and hooks a homage to the bands that inspired them, while still putting their own spin on the style. And the band didn’t go unnoticed either, picking up management and a deal with US label Pure Metal to release their follow-up Mystical Thieves. The Battlezone vinyl packaging includes an insert containing all the lyrics and a selection of previously unseen photos, as well as brand new cover art inspired by the original.